does anyone know about the Hot Fire charger it comes with? I not sure if I trust anything for ecigs with the word FIRE in it. That's also the brand of the battery inside. So I thought I'd give the Hot Fire charger a try. I've read that it may over charge. Finished at 12.71 volt according to my meter. About 4.24 per cell I guess, not the best, could have been worse. This is my first post on here so be gentle. I just received my DX200 and when I plug in the AC charger the red light just blinks like crazy (is that normal) and when I try to charge through USB the battery stays empty (doesn't show the lightening icon in the battery). Am I doing something wrong? Do I have a bad mod? Any help would be appreciated! Try plugging the mod into Escribe and checking with device monitor all the battery cells are over 3 V. It may charge via the USB, but if not there is a recovery charge option in device monitor. I think you will need to do a recovery charge as Cell 1 is 0 V, hopefully the battery is not had it. Its under the Diagnostics button Advanced options in device monitor. Vaping Bad, is something else wrong too? Cell three at 4.59V. I haven't broken any of mine (yet lol) so not familiar with failure modes but would guess the voltage divider for reading the cell taps is toast in some way? I didn't notice that, good point and it may be best to return the mod. Damn. I got it from Gearbeast. Do you recommend I contact Gearbeast for the return or Hotcig? I would start with GB, but they on holiday for a week ATM. Li battery cells should never be charged above 4.25 V, do you have a meter to check the voltages of the battery cells and confirm the readings Escribe shows as it may just be a bad battery pack. The charger is correctly detecting a faulty battery or broken balance wire. 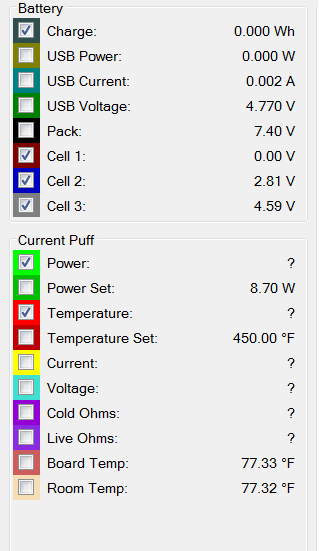 Assuming the mod is accurately reading the cell Voltages then the battery IS effectively DEAD. DO NOT under any circumstances attempt to "recovery charge" a LiPo cell that is discharged to 0 Volts without learning a LOT more about LiPo batteries. Any decent charger won't let you unless you cheat and set it to the wrong battery type, and if you could then A FIRE is the most likely result. An explosion is also a distinct possibility. Even assuming you were successful that cell will have been damaged and the battery will constantly try to go out of balance. For the price of fitting a replacement battery why take such risks. If you don't understand something so commonly known to be dangerous VapingBad why would you give any advice at all regarding the battery. If you do understand the dangers then you should realise that it is not the sort of advice to give out randomly without any warnings. I read in another post that you need to do a firmware upgrade on the Hotcigs. It seems that everyone is having battery issues before they do the upgrade. I am waiting on mine to get in the mail. Let me know if/when you figure things out.